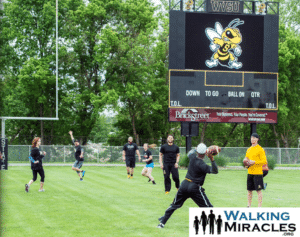 The WVSU Football Program is hosting their 2nd Annual Flag Football Tournament to benefit Walking Miracles Family Foundation. The Flag Football tournament is set for Friday, May 4, 2018 beginning at 2:00 p.m. at WVSU Football Complex. The tournament is Co-Ed consisting of 7 players, 2 of which are female. Team entry is $250.00. Contact George Shehl at George.Shehl@WVStateU.edu.